Well, my friend. You are ready to Elevate. Getting started, you spent too many hours figuring out how to build a website. Or even paid someone who didn't "get" what you're creating. You inspire, challenge & support them to become the best versions of themselves. They deserve to see & know the best version of you. A process that includes conversations around who you are and what you want out of your business. A functional, well-designed website that drives potential clients to take action. A memorable logo that connects with the deepest parts of your clients’ dreams & desires. A stronger, more confident voice for communicating the value of your work in person or online. Provides a clear, one-day process so you know what to expect & when. Speaks in terms you can understand, not all that crazy tech lingo. Designs with a focus on you & your needs not just current trends. 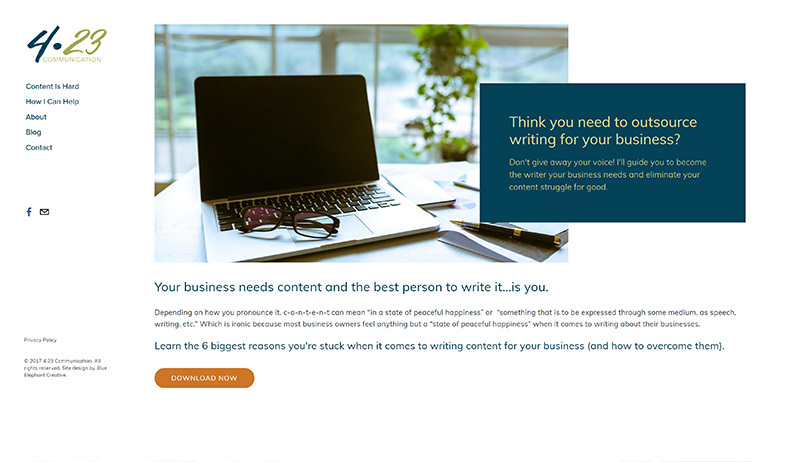 Helps you write clear, concise website content that connects with clients. Does it still feel okay to settle for ‘good enough’ when you could Elevate? It's time to feel the relief of checking your website off your To Do list. And the joy of getting it done in a day! Take the next step & book your introductory call with me by clicking below. Before we schedule your call, do you have an existing website? Enter your website address below or type NO if you don't have one. This call is a chance for us to get to know each other better and talk about your business. Select an available day / time below that will work best for you. NOTE: Please check the calendar is set to your correct time zone.